JUBILANT – The emotion I felt upon finding a robin’s nest within my wisteria bush. Birds visiting my yard and feeders is one of my chief joys, I was delighted to discover a beautiful robin’s nest this week. Now, I must tiptoe around it, and hope the mother does not abandon her roost when lawn mowers and other noisy machines create a racket. Such a lovely picture. One of those moments where you can’t help but be filled with gratitude for all the beauty in this life. Thanks for sharing! Hi Texas, Thanks for stopping by! Kathy, you really are a dreamer. 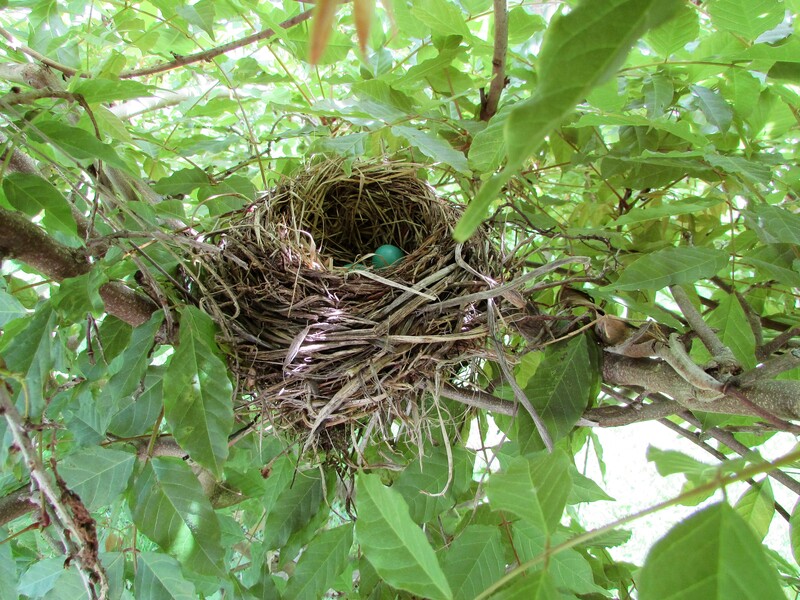 I can see the blue green robin eggs too- so pretty. Did you take this photo from the upper floor ? No, it was through the leaves. The area is a very busy part of my yard so the robin sees people daily. She seems to be adjusted to a bit of foot traffic as long as you don’t get too close. If you do she flies from the nest. When the heat of the day is high the roosting birds seem to leave their nests to feed themselves.